Download the completed 8 Layer APC40 project file and some sample movies to go along with it. The Akai APC40 is one of the most known MIDI controllers designed to be used alongside Ableton Live for DJing and music production. It also happens to be a pretty good controller for working with video and in this tutorial we'll look at some tips for setting up an 8 layer setup with controls matched to the layout of the controller itself. With this 8 layer Ableton Live style VJ controller example template for VDMX you can load in your own movie files and start mixing clips immediately. Read on for tips for getting started with this project. Below that we've included some notes notes on how you can recreate it from scratch. 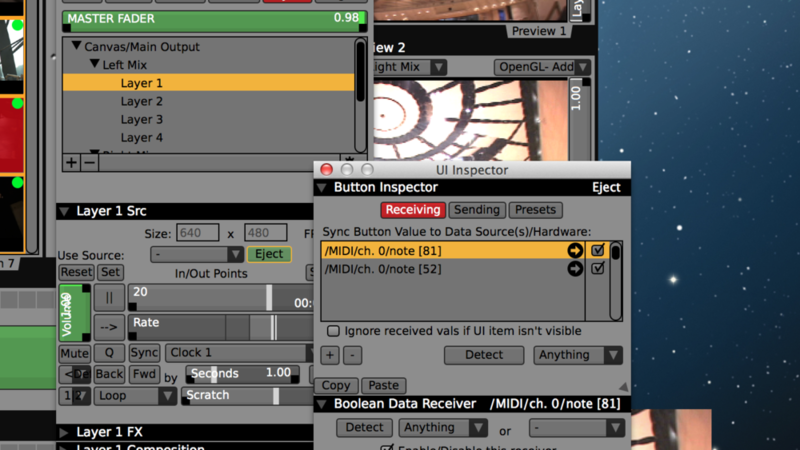 From here, learn how to map the remaining knobs and buttons to your own selection of real-time video FX and other movie playback parameters, or check out more technique on working alongside Ableton Live. Completed 8 Layer APC40 Mixer template for VDMX. Drag your own movie files from the built-in browser or a Finder window to a Media Bin to load. Shift + Click to select clips on a page. Right + Click to reveal contextual menu with file options. Clip Launch triggers each column and vertical sliders are mapped to volume / opacity. When recreating this template on your own, here's some of the behind the scenes of how we put together this APC40 setup using VDMX. Before beginning it is also recommended to cover the tutorial on setting up Media Bin UI Sync with the APC40 and Control Surface plugin custom layouts. Setting the target for 'Media Bin 4' to 'Layer 4' - repeat for each bin / layer pair. Assign volume and opacity sliders for each layer to its slider in the control surface. Use two MIDI receivers for each Layer 'Eject' button, one for the column 'Clip Stop' and one for the 'Stop All Clips' button. Create a 'Row Trigger' slider along with the Media Bin' Trigger by Float' option to activate an entire row of clips with one click (see video, right).